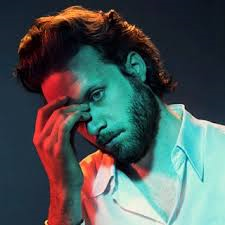 Along with John Grant, one of the standout artistes of the last decade or so, is the singer/songwriter Josh Tillman. And in common with Grant, both have come to a solo career after successful sojourns as members of bands (Grant in The Czars and Tillman as drummer in the Fleet Foxes) and have, in 2018, released their fourth albums as performers in their own rights. Most significantly for the pair is how they’ve developed personas that allow them to create albums of great beauty, artistry and self-knowing brilliance. These are guys with a story to be told with the ego, maybe even arrogance, to know that they are stories that must be told. In 2017, Tillman, performing as Father John Misty, released what became my favourite album of the year, Pure Comedy. A masterful piece of darkly bleak humour it would be an album that you’d feel might take sometime to follow up on. Tillman, however, in a two month spree of song-writing holed up in a New York hotel, created a collection of 10 songs that, whilst perhaps not to the very highest standards set by Pure Comedy, continue his fine form. Musically, the songs have that lilting ebb and flow that we have come to expect from Tillman and all delivered, vocally, in his now familiar style. Like a 21st century lounge singer performing stories that Tom Waits would recognise with the panache of a Sinatra or a Bennett, a Father John Misty album is to experience life on the edge, to understand the disappointments that come from years of hard living, and to feel the almost schizophrenic nature of having both an arrogance and an innocence that go to create these songs. Tillman, like John Grant, has come, it seems, to a knowing self-awareness that slips through their veneer of worldly wise cynicism to make works of wonderous beauty that beguile, capture and enrapture the listener.